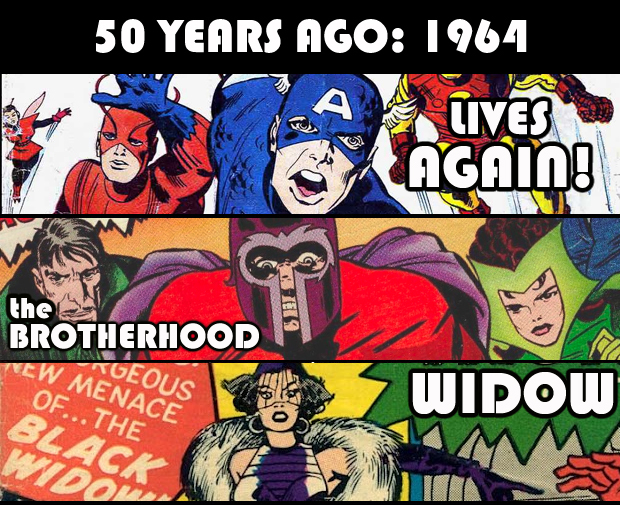 Taking a look back at ten, twenty-five, and fifty years of January comicbook anniversaries! Frontier! Book One of Darwyn Cooke’s six issue DC: the New Frontier mini-series hits the stands ten years ago bringing together all the great Silver Age DC concepts into one sweeping story (much the same way James Robinson brought all the mystery men characters together for his Golden Age story). Initially, the story didn’t grab me, even with the extra sized first issue and the large scope. The story felt too huge, too scattered, and I found myself impatient with the first two issues or so. So I waited until they were all released and then read the story in one sitting. That’s when the story really opened up, and you eventually get to a point in book three or four where the story connects and shows you just how all those characters are moving closer to one end point. Beyond being a DC Silver Age story, it is also very much a Hal Jordan/Green Lantern story as well. I enjoy stories that encapsulate a certain era or concept, that use those aspects and all of their special features to showcase the best they have to offer: Golden Age, Twilight, Marvels and even stories like Kingdom Come and the Nail – Alan Davis’ love letter to the Bronze Age. The New Frontier shows the best of DC’s Silver Age with artwork that is reminiscent of the many great artists of that time: Kirby, Gil Kane, Sekowsky, Infantino and so many more. Read the book or watch the animated movie – the New Frontier makes you want to read comics. Save the World! The first Ultimates volume, by Mark Millar, Bryan Hitch and company, finally comes to a close after two years with issue 13 in larger than life style and action putting a cap on widescreen comics that were made popular by Authority. Unlike other Ultimate versions of established Marvel characters, this story dared to be a little different in its treatment of “stalwart” heroes and how they would handle being on a team and being public super-heroes in the “modern” world. Much of the Avengers movie is based on this storyline. I can remember it being super controversial as the first issues hit, but this first volume eventually earns its place as an important story for its time. Common Grounds! From the mind of Troy Hickman and his Holey Crullers mini-comic comes the Common Grounds #1 anthology now with Top Cow. These six issues featured major artists such as Dan Jurgens, George Perez, Chris Bachalo, Sam Kieth, Angel Medina, Carlos Pacheco, etc. Holey Crullers was already playing around with the real world meets superhero genre before books like Astro City – so to see it reach a bigger audience than the mini-comics was a plus. A fun read if you can find the issues. OTHER: Wonder Woman vol.2 lands her 200th issue; Superman: Secret Identity #1 by Kurt Busiek & Stuart Immonen; Avengers #77 is only .50 cents! But it’s the start of the Chuck Austen run. Yikes. L.E.G.I.O.N.! Spinning out of the Invasion! DC event, L.E.G.I.O.N. #1 expanded the mythos of the futuristic Legion of Super-Heroes by putting the spotlight on its newly created modern predecessor. The series would run for 70 issues, ending in 1994, and would use and create so many concepts that I enjoyed; from reviving Captain Comet, using Lady Quark, giving Lobo a perfect home, and setting up interesting facets of Legion history. It also introduced me to the art of Barry Kitson. I’ve sold a full run of this title and have since purchased almost another full set to once again have in my collection. It’s hard to part with this series. Sensational! From her time with the Fantastic Four, She-Hulk gets another series, this time by John Byrne and company. A super meta adventure book, it would go on to have its ups and downs but it’s worth a read if you enjoy humor books. Doom! Grant Morrison and Richard Case take over the Doom Patrol book – becoming one of the few creative teams that can live up to the weird and crazy characters and concepts. Even co-creator Arnold Drake mentioned that this version was closest to his original ideas of the team. Eventually this series would fall under the Vertigo banner, would give us characters such as Danny the Street and Flex Mentallo, and would wrap up Morrison’s run on the book with issue 63 (Richard Case would draw a few more issues once Rachel Pollack took over). I have yet to read the entirety of this series. As I build my Morrison library, this is one of those series that is not always so easy to find in back issue bins. OTHER: Starbrand ends with issue #19; Web of Spider-Man hits issue #50; Marvel’s first Damage Control mini-series hits by Dwayne McDuffie and art by Ernie Colon; the Cosmic Odyssey has ended and the Mark Evanier/Paris Cullins New Gods series begins! Lives Again! Captain America is revived in Avengers #4 giving us his 50th Anniversary in the Modern Marvel Age. The Brotherhood! Magneto has acquired his own band of evil mutants in X-Men #4 with the first appearances, and 50th Anniversaries, of Scarlet Witch, Quicksilver, Mastermind and the Toad! Widow! Tales of Suspense #52 (52!) showcases the first appearance of “Madame Natasha”, the Black Widow. 50 Years Young as of this month! OTHER: Just like the Brotherhood of Evil Mutants, over at DC the Brotherhood of Evil (the Brain, Monsieur Mallah, Madame Rouge, Rog, and Mister Morden) make their first appearance in Doom Patrol #86; and Journey Into Mystery #102 has the first appearances of the comicbook versions of Sif and Hela. 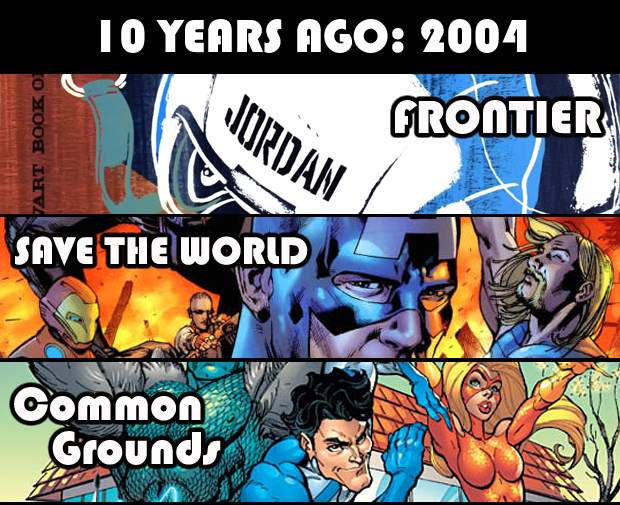 New Frontier is 10?! Wow, time flies. I loved that series, and tried to get my wife to enjoy the movie version as I did. 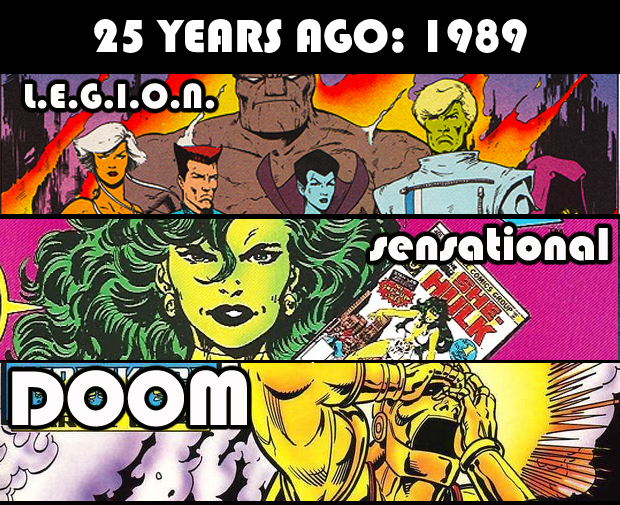 I also remember being excited about LEGION for that first year or so. Finally, I’m also building up my Morrison library, and cannot wait to dive into his Doom Patrol run. Loved yhis one Pete! I guess I am a 25 years ago type of guy! Loved those books especially Legion and Byrnes She-Hulk! Also a mention of Invasion made me smile! The Last issue of StarBrand was a loss in my mind! I loved New Universe! Did you ever read any of these? If so which ones? Thoughts? I read most of the first issues of each New Universe title as they were coming out – but I only stuck with StarBrand. Maybe because of the art? Maybe because he felt like the most “super” of the bunch? Can’t remember. For the most part SB worked until the shift in tone once Byrne took over. From there it plays out too “by the book”. Might be fun to one day absorb the entire New Universe line.